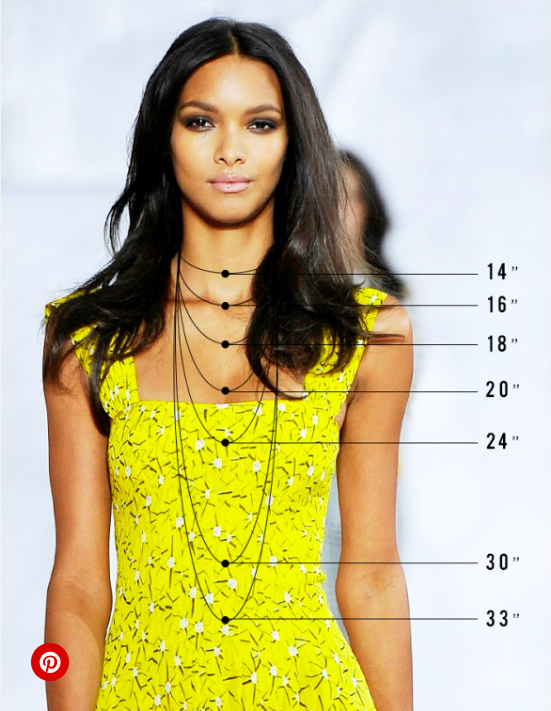 I stumbled upon this great chart the other day on Tumbler that does a pretty good job of illustrating which necklaces work with what necklines. It’s no wonder then, one of the most often asked questions from my clients is, which necklace should I wear with what neckline? Mismatched necklaces to necklines is one of the most practiced fashion faux pas I see daily. In reality it’s quite simple to master, it’s all about visual proportion and spacing. This chart is an excellent start to understanding what works well, and I’ve added some more examples here below. 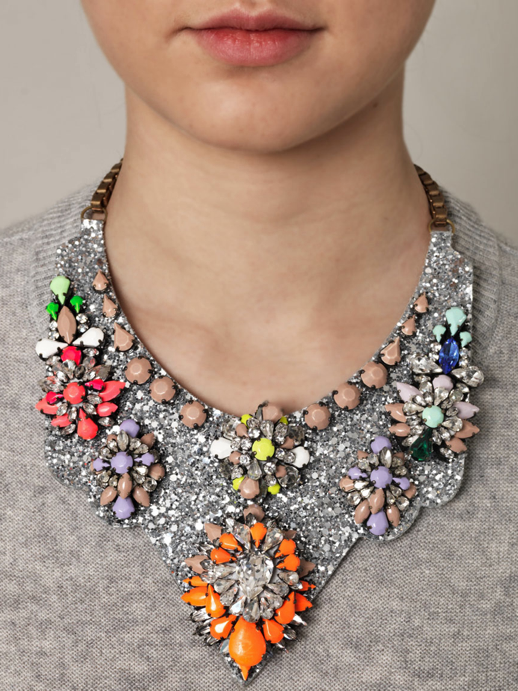 This necklace is positioned well, the outer sides of the jewels sit on the edge of the neckline. This necklace is also positioned well, it sits in the centre of the neckline and is equal distance between the base of the neck and the bottom of the open neckline. 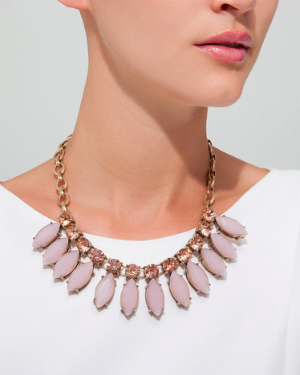 Collar necklaces like the one below should be worn with crew necklines and should sit right on top the neckline opening. 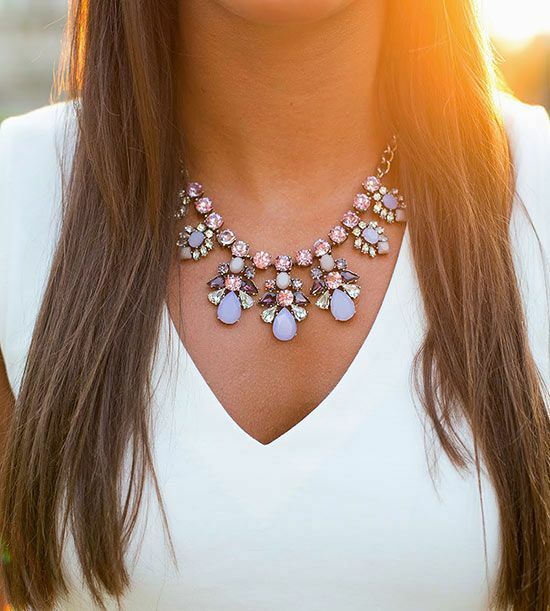 Pendant necklaces look best worn equal distance between the neckline and the waistline. How to wear multiple chain necklaces may seem tricky to master but it’s simply about creating visual balance between neckline and waistline of the dress. A larger and longer necklace is best suited to a very plain garment as it fills empty space and adds visual interest to the outfit. One of the best accessory items available that most people don’t know exist are necklace extenders. They are primarily sold in accessory stores so if you don’t see them on display ask the staff if they carry any. You can also go online and buy from the Jewel Mint store linked below. With an extender you have the ability adjust the length of any necklace, so you can keep it in proportion to your neckline or other necklaces. I liked the tips on which necklace to wear with which neckline. I love this. Have always sucked at it and now I can’t wait to experiment! Thanks!! Love your blog Meileen. Love fashion and look forward to more.